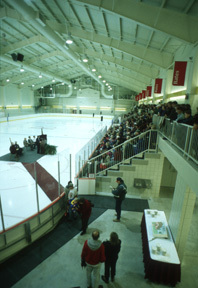 Underhill Arena, completed in 1995, features a 200-foot by 85-foot ice surface used for the Bates intramural and club hockey programs, skating classes, and College recreational skaters. Upstairs, the Davis Fitness Center features a full Nautilus circuit, BodyMaster machines, and a full array of free weights. With 5,200 square feet and a capacity for 65 simultaneous users, it is among the largest collegiate weight rooms in the Northeast.